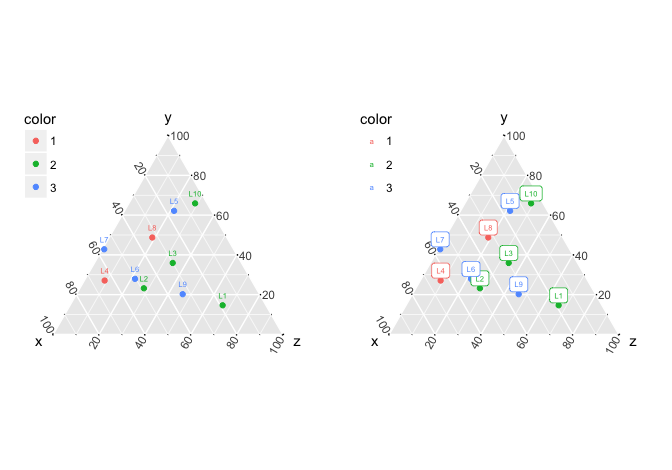 ‘ggtern’ is a software package for the statistical computing language R. It is an extension to ggplot2  specifically for the plotting of ternary diagrams. Ternary diagrams are Barycentric plots w/ three variables, and, they are commonly used within the fields of chemistry, petrology, mineralogy, metallurgy, materials-science, genetics and game-theory, amongst others. Whereas a simplex diagram is the general case for , in dimensions, the ternary diagram is the specific case when (producing vertices). 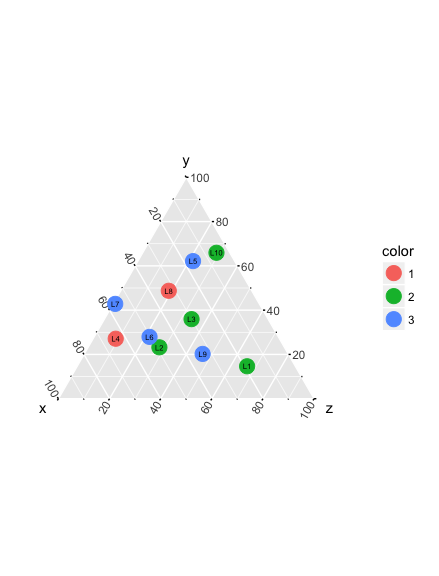 With the exception of the work by Sean Mulcahy  and Darren Wilkinson , there are very few resources on the internet where ggplot2  has been used as a platform for rendering such diagrams, ggtern attempts to bridge this gap, and has since been used within a number of publications as a direct result. H. Wickham, ggplot2: Elegant Graphics for Data Analysis, Springer-Verlag, 2009. No problem Bastian, Great to hear this kind of feedback. Cheers. 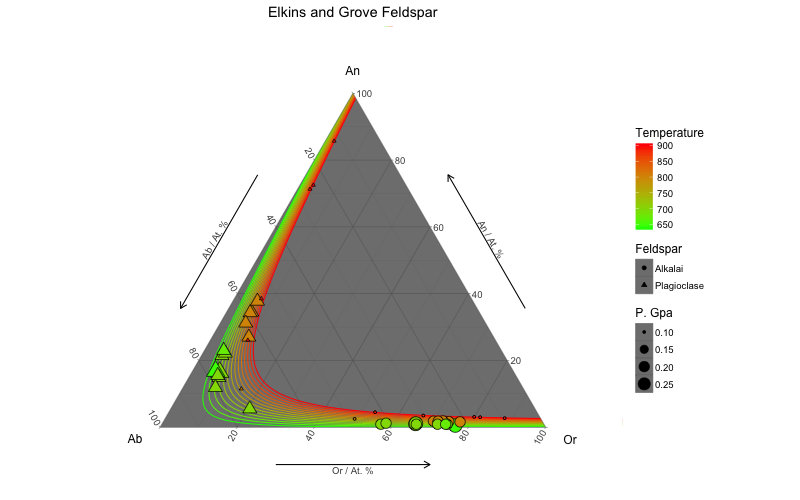 Wonderful package – is there any way to combine the plot with a phase diagram graphic within ggtern? Something akin to this? Not sure what you mean, can you provide an example? It would be tricky to overlay, however, there is nothing stopping the entire phase diagram being drawn in ggtern…. if you have the time…. Until I make another update to CRAN, you will need to clone the git repo and install from source. That’s awesome! Thanks so much for that – this is such a great package. Thanks for putting it out there. Quick follow up question – since this is just for raster images (annotation_raster instead of annotation_custom), is there a way to scale the image to fit the parameters of the ternary diagram? Ordinarily, I’d use a grob and set the lims to Inf to get it to auto-scale using annotation_custom. Is that possible with the adjustments you’re made using just raster images? At the moment I have a beautiful phase diagram behind my data points, but the image is ~75% the size of the ggtern plot. Scott, you need to tweak the xmin, xmax, ymin, ymax values. Basically, if you use an image which has NO whitespace external to the bounding rectangle defined by the three apexes, then xmin = 0, xmax = 1, ymin = 0, ymax = 1 should place the image correctly. Max, can you post an example of what you mean please? Hey Nicholas, this is an awesome package! I’m using it to create plots for a scientific artictle right now. However, it seems that I came across an error: I have a plot where I need the grid lines on top, so I’m using the “theme_gridsontop()” option (or tern.panel.grid.ontop = TRUE in theme options). But when I do this, the axis labels don’t get plotted anymore! If I remove that option, the labels are plotted just fine. Here is an example plot that shows you what I mean – I can only get the left or the right version, not both – but I have been able to create plots with both options before. Try upgrading, works fine for me, may be a bug in a previous version, I recently re-worked all the axis-rendering routines. Thank you very much for the package! We are working with it, but applying to environmental data – sterols in sediments – in order to find something about where the organic matter comes from.We are from UFPR, a University in Brazil. So, as beginners we find a lot of troubles! We could plot it, ok, very cool graphic!! But can’t find a way to label each dot, i.e. with its codes or sample numbers. Tried it in many ways. I imagine this is a basic thing… But can’t achieve this. Could you please provide us a basic script that could do that in a ternplot (label each data point) in order to use it as a guide? Maybe you already have it done but could not find anywhere. No problems Marina, Glad it worked out!. Not a big issue, but I noticed that you (probably) brought the grids to the front (via theme_gridsontop)? Is there a particular reason for this? Usually this can be desirable for the special case where one is plotting polygon geometries that cover the entire (or a large proportion of the) surface. In your situation, some of the grid lines have divided the points, which can be misleading. In fact we needed do fix it, the gridlines were above the dots for mistake, but I don’t know why. Now it is perfect. Thank you so very much! I’ll ask for my friend to post the script she used, just in case. Regards, have a nice week! 2. Is it possible to use factors instead of numeric values for the three axes? In regards to item 2, the answer is no, ternary diagrams are representations of compositional data, factors have no bearing other than for grouping sets of data, certainly not when it comes to positioning. The geometries are limited, due to the simplex nature of the coordinates. Heatmap is something I am planning to add, but I am not sure on the timeline. In regards to using factors on the sclaes, how would you propose that this would work, given that each point on the surface represents a composition. If you are simpley wanting to change the labels on the axes, then this can be done no problems. hexagonal or triangular heatmap is now included from version 2.2.2 and beyond. Hi Nicholas, great work on ggtern! The older version of ggtern would not work since ggplot2 complains about the older ggproto version. Any hints? Digging a little more, it appears that the status on CRAN reports that currently ggtern is only completing the check and install on OSX, and fails on Windows and Linux (which I’m on). Marco, this is an issue with the latest ggplot version. I havn’t had the time to ensure compatability, try reverting to ggplot 2.1.X, apologies. Understood. Any timeframe for a possible fix on your side? Just asking, I’ll manage with the workaround. Marco, I have just submitted to cran, cant imagine there will be any issues. You can download and install from source, from my bitbucket account. May be a few bugs, let me know if you have issues. Thank you very much for the wonderful package! I would like to use your package. But, I have a trouble. I can not run ggtern() function, because of an error: “GeomMask was built with an incompatible version of ggproto. Please reinstall the package that provides this extension.” How do you solve the problem? I am sorry to disturb your busy time. I coped with the problem by downloading and installing the old ggplot2 package. Takahiro, have submitted update to CRAN, you can download and install from source from my bitbucket account. Thank you for your contribution of this useful ggtern package. It shows the following warning message when executing. “GeomMask was built with an incompatible version of ggproto. Please reinstall the package that provides this extension. Is there any solution for it? and how? Jheng-Fong, Have submitted update to CRAN, you can download and install from source from my bitbucket account. motion that can sometimes develop air pockets. Thanks Yvette for your incredibly irrelevant comment. I manage to make the plot am trying to color my data with a numerical variable. Is it possible to get a color gradient? Thank you for creating such beautiful package. I am quite new to R language, I am working on classifying oceanic rocks, I want to draw the boundaries in the ternary diagram using some conditions and then I want to see where the points fall, would you kindly tell me how to do it using this library? Thank You. is there a way to implement function similar geom_encircle from package ‘ggalt’? I see on the top picture of this website you have the green area drawn around data points. I need to do the same thing for my data points. Stat_density_tern isn’t what I need. David, sorry for the delay. This should be easy. Can you email me? David, the next version coming out has geom_encircle as an approved geometry. is there any way to plot a QAP(F) plot (for plutonic rocks) using ggtern? i.e. a template like the Shepards Classification of Sediments? hmmm interesting. Doing the top half, and the bottom half independently is easy. Putting them together is a little harder. I have been thinking about the best way to do piper diagrams, and this problem is a little similar. Let me think about it. Your package looks very useful. I noticed, that it’s not yet added to the ggplot-extensions website http://www.ggplot2-exts.org/index.html. Ever thought about adding it? I think that would be a benefit for all gpplot2 users. Um, yeah I have been meaning to do that for a while. Hi Nicholas, Just passing by to recommend another publication using your ggtern R package – loved to play (and struggle a bit) with that! I have noticed you snuck-under my spam filter you little trickster. Can you adjust the axis values so that they do not equal 100. For instance x data range 0-30, y range 0-20, z from 0-50? Also how do you list negative values? Can you tell me what is the meaning of “expand=1″ in the structure of stat_interpolate_tern(….., expand=1….). If I already have the relationship between Value and x,y. How can I insert to your structure? While I already know that value=A=27.6+9.11*V+2.68*H! Hello, How I can download it? , It looks so nice and I think we could use it in our analysis. So would you please help me in download it. Do you have R installed? This is a package for the R language for statistical computing. My advice, install R, RStudio (IDE), and then you need the required packages (ggplot2, ggtern, etc….). If you are not familiar with ggplot2 syntax, then you may have some work to do, in order to become proficient. Many thanks for this package. This is a very useful tool for presenting the information. In my case, I have made a ternary diagram given a weight of household. I want to change the size/colour of the dots as per their size of the household, but I could not do that. Although I have kept the ‘scale_shape_manual’ in the script, it does not produce the colour accordingly. Please look into the following script. where, General, Muslims, SC/ST are the groups of a population presented in a ternary diagram. ‘Total’ in the second line represent the weight based on which I want to decide the size/colour of the dots in the diagram. For example, ‘Temperature’/’P. Gpa’ is in your following diagram. Could you please suggest me a solution? There are a few things, ‘fill’ and ‘colour’ are two different mappings for those shapes. Also, you need to map ‘size’ to a variable, rather than using a fixed size. Without seeing your data, perhaps consider the following. I got what I exactly wanted using this script. Is it possible that the error bars of data points can be incorporated into the ternary plot? Sean, yes, see ?geom_errorbarX, there are three geometries (ie geom_errorbarT, geom_errorbarL and geom_errorbarR). There is an example in the help file above. Thank you for this very nice package. I am using it for my shiny app. But somehow, I have some compatibility issues. I am currently using ggplot2 + plotly in my shiny app, but once I load ggtern (not attached), or call ggtern using ggtern::ggtern, other dynamic plots using ggplotly do not work. Do you know what’s happening here? Thank you very much! This is still an issue!? As of R 3.4.0, NULL variables can no longer have attributes. This means that using geom_density_tern() results in lots of errors. To reproduce, run example(geom_density_tern) and look at the warnings(). At the moment I cannot work with this function. Is it planned to solve? See my response to John Below. Nicholas, many thanks for a wonderful package. I use it extensively, and it featured prominently in an AAPS talk I gave last spring. I am looking forward to the new version with hexbinning etc. message/error is due to a function in the compositions package. At least that is what generates the message for me. That package has not been updated in more than three years. Given that this warning will apparently become an error in R 3.4, this is more than a little concerning. Thansk for letting me know about the structure(NULL,…) error, which was brought to my attention by someone else too. If compositions doesn’t sort it out, do not worry, I can get rid of the package altogether in favour of writing my own versions of the two functions that it is used for (acomp and ilr) in terms of ggtern. Is there any possibility to avoid overlapping text when using “geom_text” and have something like an automatic placement? The following code will suppress Label 2 but I would like to have Label 2 plotted without overlap at alternative position. I know how to do it manually, but I have a lot of points and a lot of plots…. hi, Nicholas, i have question: how to change the order of arrows (with axes) in ggtern?, thanks. I am a R program user and read about your R package for “Shepard Sediment classification diagram”. I have data on sediment-grain size and want to make “Shepard Sediment classification diagram” but it is my first time to work on sediment grain size data as I am a fisheries biologist. I need your kind help, how to prepare data to present it via a ternary plot using your packages. Way at the top, was it intended to be baRycentric? Ggtern is a amazing package for visualizing allometrical relationships. I was wondering whether it is possible to calculate the area of either a polygon or a confidence ellipse plotted in ggtern. And whether if it is probable to calculate said area, would it be possible to calculate the percentage or overlap area of two polygons or ellipses plotted on the same graph. Dear Nicholas, great work on ggtern ! What should i do ? Is there any possibility to avoid obtaining this error ? Hello. This is an amazing package! However, is this working in the new ggplot version? and it works quite well for the visualisation of my data and the density but still not enough for me, I want to choose 5-10 most representetive points. do you know how I can put some labels based on the density intesity? First, I really like your package ! It’s a great job and very useful !!! Others examples seem to work if them_tern_*** is not called.